Strange weather we’ve been having lately! First we had one of the worst droughts ever in the Midwest over the summer, and then a record-breaking “superstorm” in the fall on the East Coast. Many scientists suspect that global warming, and the extremes in weather it causes, is behind them both, or at least is a major contributing factor. Indeed, the past 12 months in America have been the hottest on record, and the water in the Atlantic Ocean fueling hurricane Sandy was way warmer than normal, in some places as much as 5 degrees above average. What’s meat got do with it? Plenty. Raising livestock for meat and other animal products is now recognized to be largest cause of global warming. The ground-parching droughts and the house-flooding storms might just both be driven by our meat centered diets. Global Warming is a really important issue, but recently it seems that people haven’t been talking about it so much, and it has been slipping off people’s radar screens. So this month, we would like to bring your attention back to global warming, and in particular to how meat consumption is having an effect. You might think that the lack of discussion means that global warming isn’t very important, but in fact, the opposite is the case. Let’s start at the beginning. Scientists tell us that there has been an increase in the level of certain gasses in the atmosphere, such as carbon dioxide and methane. These gasses prevent heat from escaping from the earth. This is called the greenhouse effect. If this continues unchecked, it will result in a gradual warming of the climate, and that will result in tremendous hardship for people all over the world. There is evidence that this is already beginning to happen. For instance, one can see photos of the spectacular recession of the glaciers in places like Switzerland and the Andes Mountains. There have been record-breaking high global temperatures in recent years as well. Many scientists warn that the future holds much more severe consequences, if the process of releasing large amounts of greenhouse gasses into the environment isn’t reversed. A small number of scientists note that the earth is still gradually emerging from the last ice age which could account for the recent warming. Even so, they point out that it would be prudent to reduce the emission of greenhouse gasses, which only make a natural problem even worse. Either way, reducing the production of these gasses seems to definitely be in the interests of humanity. Now, there has been a fair amount of study recently about the amounts of greenhouse gasses that livestock agriculture throws into the environment. One study conducted by the UN showed that raising meat causes more global warming than all the cars, trucks, busses, ships, boats, trains and airplanes in the world all put together. That’s right, the food you eat is more important than the car you buy, whether or not you fly to your next vacation or stay home, whether you carpool to work or drive your own car, and whether you buy local products or out of region. Another study, conducted by two senior members of the World Bank on behalf the World Watch Institute, showed that raising meat actually causes more global warming than all other factors combined. It turns out that the food you buy is more important than whether or not you buy compact light bulbs, or even whether the power company uses coal-fired plants or solar energy. As matter of fact, so dominant is the effect of meat production on global warming that the CEO of one solar energy company said that even just a measly 1% reduction in meat consumption would be the equivalent of 3 trillion-dollar investment in solar energy. This bears repeating: even just a 1% reduction in meat consumption is the equivalent of a 3 trillion-dollar investment in solar energy. Now just imagine how much a 10% reduction would be worth. It would be surprising if meat production didn’t have a major environmental impact, because raising livestock is so wasteful and inefficient and because the scale of animal agriculture is so vast. Take a deep breath for this one…every year we raise 56 billion animals for food. That’s nine times the human population. The livestock industry now occupies, directly or indirectly, one-third of the earth’s non frozen land mass. Add it up: 56 Billion animals plus about a third of the habitable land mass of the earth. Of course, there are going to be consequences, and big ones at that. 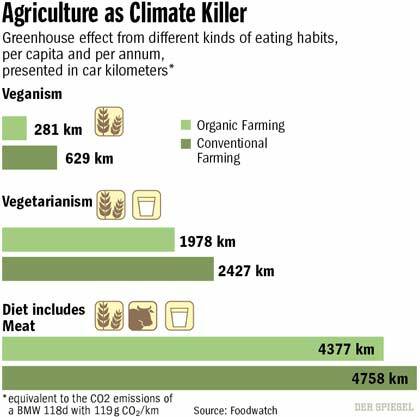 The best solution to global warming is the simple yet powerful vegetarian diet. And this solution has many advantages. It costs no extra money, it requires no new technology, it requires no international conferences, it requires no treaties and it’s something we can all get started with right away. Switching to a vegetarian diet reduces greenhouse gas emissions by 3,267 pounds per person per year. But if you’re not quite ready to become a vegetarian yet, consider this. Even small changes in your meat consumption make a big difference when it comes to global warming. According University of Chicago geo-physicists Eshel and Martin, even just cutting back your consumption of meat by only 20% is equivalent to switching from a standard car to a hybrid. Small changes do make a big difference. So if you’re just starting to change your diet, remember that we’re here to help. Our four books and free classes provide you with all the information you need to get started. In time you’ll discover that countering the effects of global warming with vegetarian food is easy and delicious. In fact, preserving the environment never tasted so good.